At least 40,000 bikers brought France to a complete standstill all day yesterday (23rd October 2010) in protest at the proposed introduction of a compulsory annual test for motorcycles and the continued ban imposed by the French authorities on traffic filtering or lane splitting. French bikers massively reject the proposed introduction of a compulsory annual test for motorcycles, which they see as a pure stealth tax imposed by the Government and another attempt to treat motorbikes and scooters like cars. The bikers don’t agree with the French Government that the introduction of a compulsory road safety and environmental standards test on all motorcycles will actually reduce the number of accidents involving motorbikes and scooters. Protestors argue that it is actually by providing motorcyclists with additional and on-going training that the number of accidents on the roads may reduce, not simply by imposing a technical and safety test on each bike designed to bring revenue to the Government. The bikers also claim not to have been consulted on the issue and therefore decided to go down the streets en masse and bring the whole country to a complete standstill to make their voice heard. French bikers are also fed up with dealing with a Government that keeps banning lane splitting or traffic filtering, when the whole point of being on a bike is to save time and not get stuck in traffic like cars do. 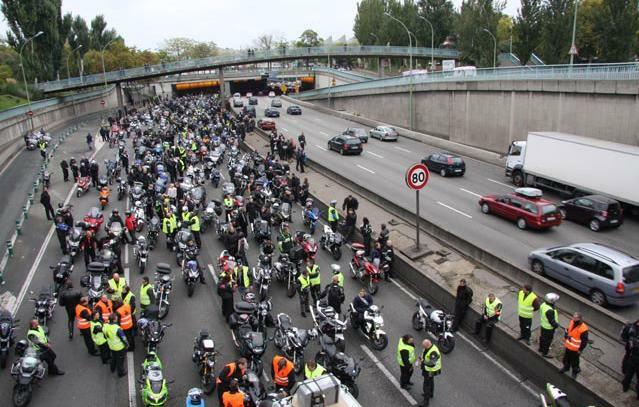 Paris alone saw 10,000 bikers invading the streets and blocking the ring road (“peripherique”) for hours, causing enormous delays and traffic jams absolutely everywhere. Paris yesterday was the scene of complete chaos with the Police being unable to regulate and control the situation given the very high number of protestors. Thousands of bikes delibarately remained stationary on the “peripherique” in order to block it, despite the Police desparate attempts to keep traffic moving. The traffic in all other French cities, including Lyon, Marseille, Lille, Bordeaux, Toulouse, Nantes, and Nice, but also in smaller towns like Tours, Montpellier, La Rochelle, Toulon, Avignon, Clermont-Ferrand, was also blocked for hours with thousands of bikers protesting and shouting their anger in the streets. “We will never accept to be treated like cars and we will bring the entire country to a complete standstill again and again, until the Government recognises that bikes are not four wheel vehicles”, said one angry protestor to one of our contacts in the second largest French city of Lyon. To make sure that the national protest was going to be well covered in the media, thousands of bikers assembled en masse outside the offices of one of the main television channels, TF1, and used their horns all at the same time to disrupt staff and force them to report the protests in the national news. Unsurprisingly, the protests were well reported in the national news on the same day for every French citizen to see and enjoy! After a successful wake-up call to the media, the same bikers gathered en masse outside the Government offices in Central Paris and the local councils in other cities and towns nationwide to express their anger and disgust at the authorities. A concert made up of horns and people shouting severely disrupted official meetings so that the authorities were forced to pay attention and listen to the protestors’ message. “If the authorities continue to make traffic filtering illegal and refuse to scrap their proposed introduction of an annual motorcycle test in a pure attempt to raise revenue, we will continue to make their lives a nightmare. We are thousands of us and we have the power to bring the country to a halt again if need be. We are the ones who ride and decide, the politicians have been elected to implement the policies we want to see implemented”, said one protestor standing outside the Government offices in Paris. 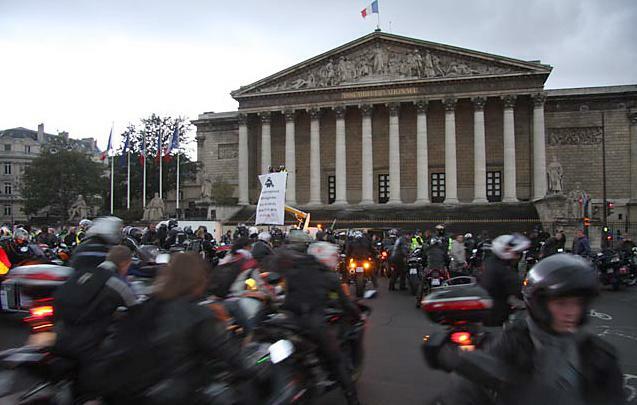 This enormous national motorcycle protest, the second this year after the one that took place on 13 March 2010 (click here for more details), comes at a time when the French are also protesting at a legislation change imposed by the Government on the retirement age. The Government has recently announced that French citizens will have to work two years longer to fund their retirement, which has been very badly perceived by the population. Protests have been taking place everywhere in France with the main action being to block petrol supply in the whole country until the Government backs off. Let’s hope that the French Government will see sense soon, otherwise they will most likely have to face the consequences of some more severe and disruptive action. France is a country where the power belongs to the people, not the authorities, and the French seem to be more keen than ever to keep it this way! CONGRATULATIONS TO THE FEDERATION FRANCAISE DES MOTARDS EN COLERE (FFMC – FRENCH FEDERATION OF ANGRY BIKERS) FOR THEIR FANTASTIC EFFORT IN ORGANISING SUCH A SPECTACULAR PROTEST ALL OVER FRANCE! HATS OFF TO THEM FROM ALL THE BIKERS IN THE WORLD! A fantastic scenes and you must have had an outstanding day. I wish you every success in your fight for common sense in Government. We need to stick together in the face of stupid legislation, unfair taxes and oppressive, restrictive EU legislation. Resistance such as this must indicate to the legislature that motorcyclists will not tolerate their meddling and stupidity.